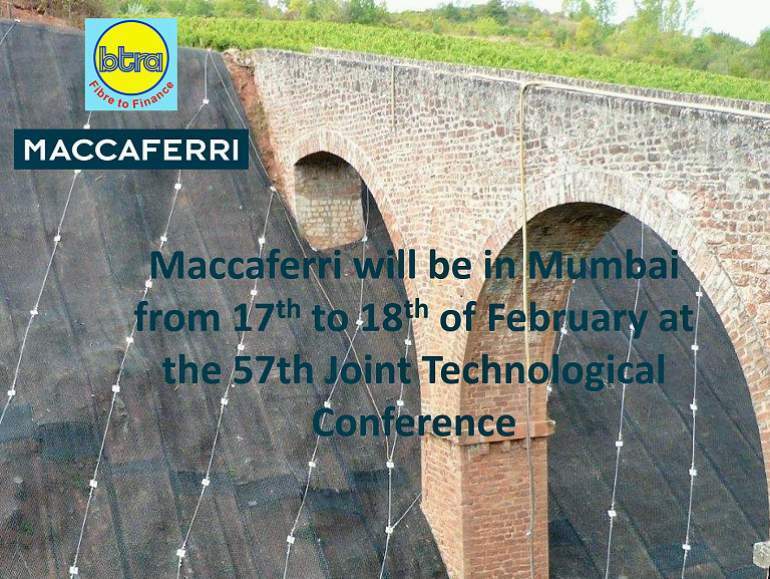 Maccaferri will give a presentation entitled “Metal net covered sand fill bags for erosion and flood control” at the 57th Joint Technological Conference being organised by The Bombay Textile Research Association, during a special session dedicated to Geosynthetics. The 57th Joint Technological Conference is being organised by The Bombay Textile Research Association (BTRA) in Mumbai this weekend (February 17-18). The other associations involved are The Ahmedabad Textile Industry’s Research Association (ATIRA), The South India Textile Research Association (SITRA) and The Northern India Textile Research Association (NITRA). Dr. Kavita Gupta, Textile Commissioner, will be the guest of honor for the conference that facilitates discussions on research and development carried out by the four textile research associations, and discusses the possibility of adopting them in the industry. In addition to the topics based on textile related areas, the BTRA is planning to have one dedicated session on Geosynthetics. This particular session is being jointly organised with the Office of the Textile Commissioner, Ministry of Textiles, Government of India. This particular conference will provide conventional textile manufacturers an opportunity to learn more about the machinery and processes involved in creating textile products, especially geosynthetics. Dr. Ratnakar Mahajan, Deputy General Manager, Maccaferri Environmental Solutions Pvt. Ltd., will give a presentation entitled “Metal net covered sand fill bags for erosion and flood control” during a special session on Geosynthetics which will take place on Friday (February 17th) at 2.15 pm in the Main hall.